TO THE POINT: "We don't focus enough on leadership training," Green observes. "We have to work on that." As Generation 2000, the JLP’s youth arm, heightens its mission of empowering Jamaica’s future leaders with a message centred on positive change while celebrating the genesis of its newest chapters, TALLAWAH talks exclusively with on-the-ball president Floyd Green about modern Jamaican politics, youth leadership, and being a family man. TALLAWAH: You’ve been President of Generation 2000 (G2K) for quite some time now. Are you pleased with your tenure so far? FLOYD GREEN: I think so far most of the objectives have been reached. One thing that we wanted to do was ensure that our chapter network is active and that all over the country we have areas where young people who are interested in politics can get involved. And we’ve been able to launch a few new chapters and one tertiary chapter at CMI, which we’re very proud of. And we’re looking to do more. TALLAWAH: There are Jamaicans in some quarters who say the Jamaica Labour Party has seen its best days. Do you agree? F.G.: I don’t think so. I think the best days are yet to come. Clearly, the party has gone through some transitioning, but what I have seen in terms of the amount of people who have expressed interest in us, is that there are a lot of talented and excited young people who want to help lead a real renaissance in the labour party. TALLAWAH: Speaking of the road ahead, is Jamaica adequately preparing its next generation of political leaders? F.G.: I don’t think we focus enough on leadership training. It appears that we believe leaders are born, but in other parts of the world, significant programmes are put in place to train leaders and to train people so that when they reach certain positions they have the relevant basics. And I think we have to work on that. TALLAWAH: Growing up, what did your parents tell you about being a man? F.G.: They always encouraged me to give back and to know what is happening and stay in tune with what is going on, and to play my part in society. They saw it as part of my academic development as well, and I think that has helped me a lot. 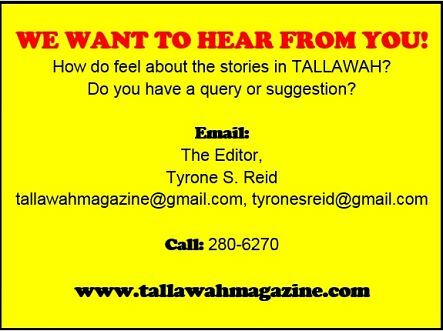 TALLAWAH: So do you have plans to start a family of your own someday soon? F.G.: I do have a family. I have a son; he’s a year-and-a-half. And I think my service has taken on more meaning now because of him. TALLAWAH: That’s beautiful. Will your kids follow you into politics? F.G.: I don’t know. I don’t believe you should dictate. None of my parents were in politics. I don’t think you dictate to your children; you just try and be an example for them and lay a foundation that whatever they want to do they can pursue it. TALLAWAH: You’re 32 now, but when all is said and done, what do you want your legacy to be? F.G.: I hope that I inspire more and more young people to get involved in politics. I think, at the end of the day, we have a very limited perception of politics and political parties in Jamaica. And I know I won’t be able to change it by myself, but by my example I want to inspire the people who really want to make the change and help in creating a better Jamaica.